A few weeks later in late December, 2009, Jack and Nataly, a.ak.a. Pomplamoose, drove down from Northern CA. and we knocked out the healthy beginnings of six songs, shooting footage for the videos as we recorded. We spent three more days together up north in June and are in the midst of a whirlwind day and half as we speak. We have three videoSongs about ready to pop out of the oven, all of which I’m very excited about. They’re a fantastic blend of the similar in spirit yet very different styles we have. 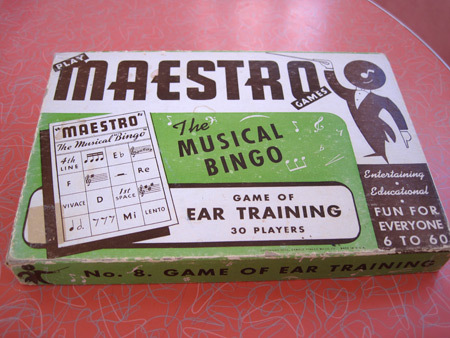 If we took any breaks, which we don’t, I might try and figure out how to play “Maestro The Musical Bingo”. But I’ve always been able to keep up just by banging pencils together and humming into one of the four digital recorders and two cell phones that are always on me and singing higher than the illegitimate child of a BeeGee and a chipmunk. 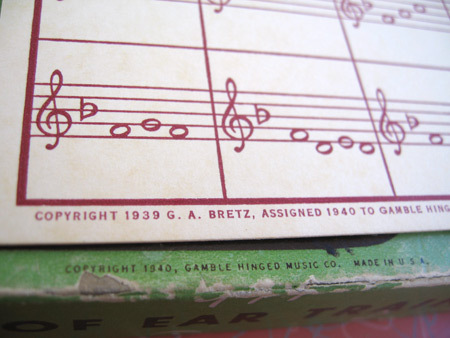 One of the greatest kitsch aspects of “Maestro The Musical Bingo” is that in one place it says it was made in 1939 and in another 1940. I will concentrate much more on writing great songs and doing great videos and, in the case of our first Pomplamoose with Allee Willis release, “Jungle Animal”, designing a spectacularly cagey and musical online music game and contest that will launch right before “Jungle Animal” comes out. This will hopefully be within a few weeks, whenever we can finish enough to put the puppy, or lion as it were, out there. 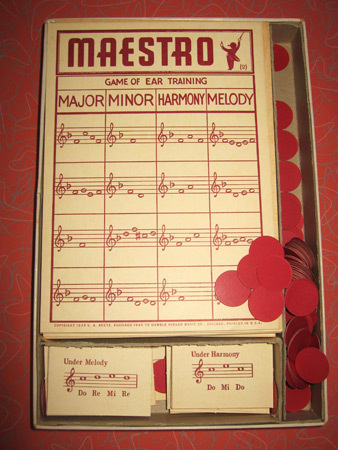 In the meantime should I find a spare a second I might try moving a few markers around and attempt to learn the names of the keys that my fingers fall on as I poke out tunes that come into my head. 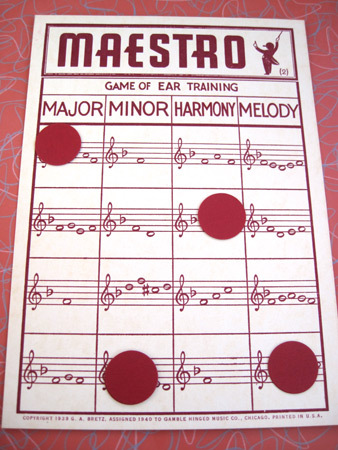 I doubt that I will make it far into the jungle known as musical theory but the important part is that whatever little animals I hum turn into songs and find their own way out of the jungle. That’s far I have led a pretty successful Safari, with or without a guide to assist me. Love the little jungle animal sneak preview. Looking forward to what you guys come up with! 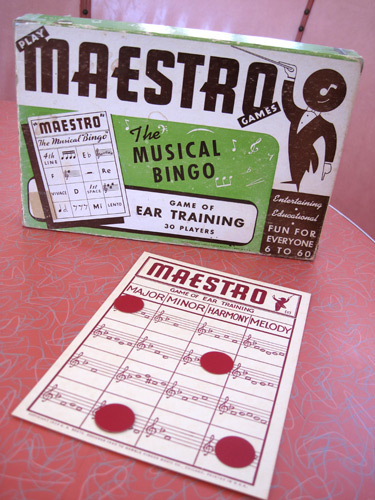 Wondering how to play Maestro Musical Bingo? 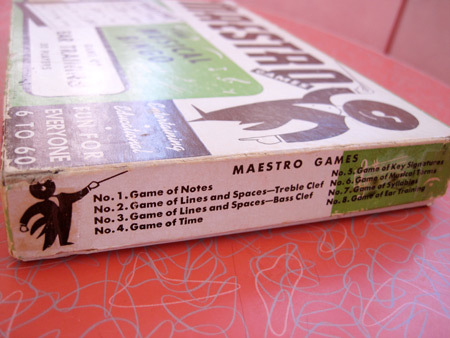 ?… The Maestro is very dapper…great art, love the “note” detail on his face. 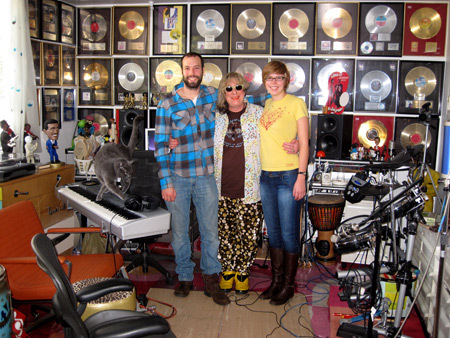 Can’t wait for the new Pomplamoose/Allee Willis release… love your Jungle Animal Art..
A game of ear training. How cool is that?! I love this game and was dying to peak inside. Thanks for posting this! I am so excited for the Pomplamoose with Allee Willis release! I still look around for jungle animal items in anticipation of the songs release! Can’t wait.